Macarons from Laduree in New York. I've wanted to get my hands on these for awhile since they're know to be the best macarons in the world, but I didn't see how they're substantially better than many other macarons that I've tried but they're still delicious. My homemade macarons weren't as perfect as these but they're...not so inferior I'm proud to say ^_^. Green tea mille crepe cake from Lady M, also in New York. I was impressed by this because check out dem layers. I wouldn't want to make this at home. The pastry cream between the layers was delicious. Mangosteen from a street fruit vendor cart in Toronto. It's such an interesting fruit that reminds me of a pomelo in flavor but the texture has no equivalent. They were also selling lychee the size of golf balls... so crazy good. 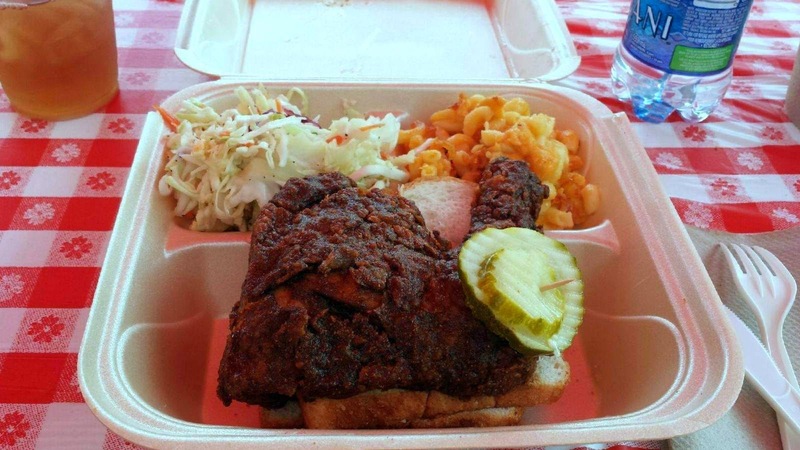 Hot Chicken Takeover! I wanted to try this popup for so long since they currently have a 5-star average (!) on Yelp with 60+ reviews. There's three flavors: cold, hot, and holy. The hot is very spicy but very flavorful, so it's my fave and it's the flavor pictured here. The cold is regular fried chicken. The holy is nonsense. Jazz and Ribs Festival. I waited two hours in line for these mediocre dudes (I know I should've left, but I was committed already). My homemade ones are better. Skyline Chili Yelp event! This was my first time at Skyline and the only way to describe it is oddly delicious. Also, I won a raffle basket with lots of Skyline swag... most random awesome raffle prizes ever. Steamed cod from Khoi. This was wonderful because the more ginger and scallions the better. I got this souvenir dude during my New York/ Canada trip, and I can't stop giggling a bit when I see him (how scandalous). There'll be more posts to come with trip food photos so stay tuned!